Sally's Sea of Songs: Music Summer Shop Hop! We've got something exciting to share! 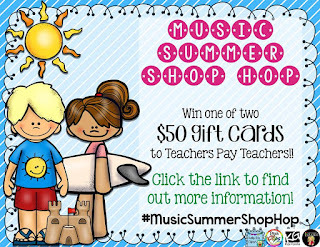 A group of 19 music teachers on TeachersPayTeachers have collaborated to do a fun giveaway starting on Thursday, June 25th and ending on Saturday, June 27th! YOU can win one of two $50 gift cards to TeachersPayTeachers. That would come in handy because I certainly have enough on my wish list! 2. Then click the green "follow" button at each store while you are there. 3. Now click "next" (right next to the letter) to go to the next store and get the letter, etc...There should be 19 letters total. Good luck and thanks for all the support you give! This giveaway runs from June 25-27th. Winners will be announced on the 28th!